Below you will find selected projects that Marcela has worked on in varying capacities. For each project, you will see samples, a summary and a description of the roles Marcela occupied in the design, development, and implementation. For additional information about a project, please feel free to contact Marcela using the contact form on this site. Thank you for your interest and have fun looking around! 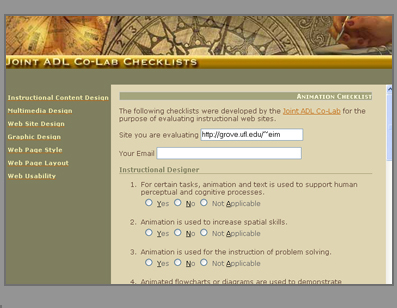 This website was implemented as a project management and quality control tool by Marcela at the Center for Instructional Technology and Training. They build off of content developed by the Joint ADL Co-Lab in Orlando and incorporate mailpost technology for documentation and tracking. Aymara is the indigenous language of people living in the Andean region of Bolivia, Peru and Chile. Compelling social and political reasons have placed a spotlight on the lack of education available for those seeking to learn this language. 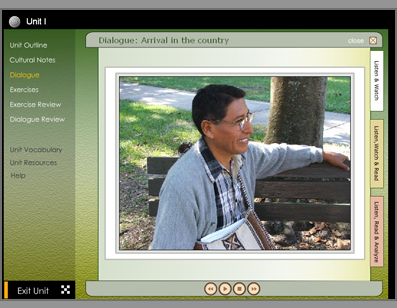 This project implements the teaching materials developed by anthropological linguist, MJ Hardman, using the latest in educational technology. The project incorporates a database back-end with a flash rendering engine, pushing the limits of what this software has been able to do to date. 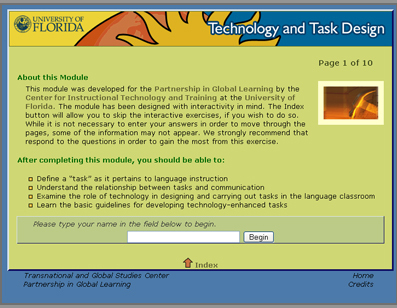 This module was developed for the Partnership of Global Learning initiative. The goal of this group is to produce and share e-learning materials for grades k – 12, which can be translated to English, Spanish and Portuguese and delivered around the world. 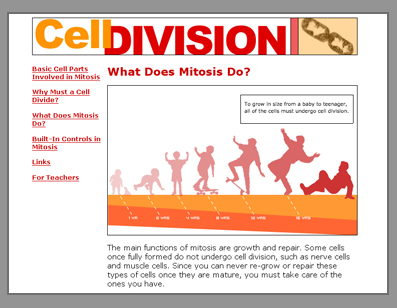 The Cell Division module integrates Flash animations, self-tests and images to convey the fundamental concept of mitosis. National Award Winner: November 2005- This project has been honored with the PRIMO Award (Peer Reviewed Instructional Materials Online) by Association of College & Research Libraries, a division of the American Library Association (ALA). The goal of this project was to develop a web-based tutorial that teaches visitors how to use the Cumulative Index to Nursing and Allied Health Literature (CINAHL). The tutorial has a parallel structure, modeling specific behavior through narrated case studies and subsequently inviting students to apply the behavior in closed simulations. 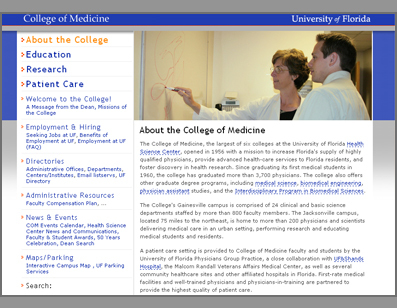 When the College of Medicine decided to redesign their website, they contacted Marcela to perform an ongoing assessment contract, geared toward validating ADA accessibility, W3C standards compliance and usability. Marcela reviewed the development progress at critical stages and provided assessment reports that were then used to improve and optimize production. The Educational Leadership Initiative is a five-year federally funded project of the Southeast DBTAC geared to improve access to information technology for educational institutions in the Southeastern United States. 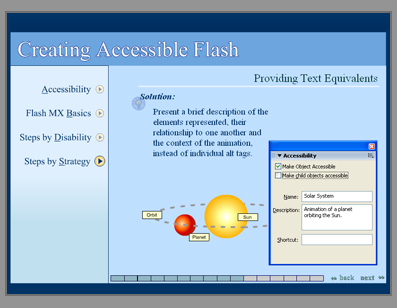 This Flash animation was developed as a training instrument for the 2004 Education Leadership Academic, hosted by the University of Georgia and the University of Florida. 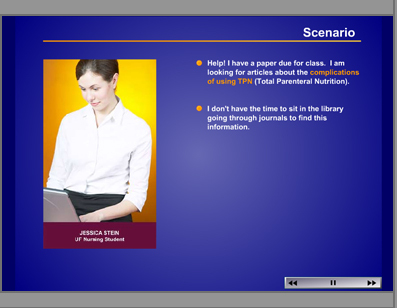 This Flash presentation was created for the Graduate Teaching Assistants Orientation, required of all new TAs at the University of Florida. It serves as a resource to graduate students new to teaching, by providing a brief overview of the issues that should be taken into consideration when selecting content for online activities. National Award Winner: July 2004- This project has been honored by the American Society of Horticultural Science with the annual “Outstanding Puiblication” Award. The site is the online translation of the face-to-face Effective Irrigation Management workshop conducted by IFAS extension. It incorporates interactivity and multimedia to convey valuable information pertinent to Environmental Horticulture growers. 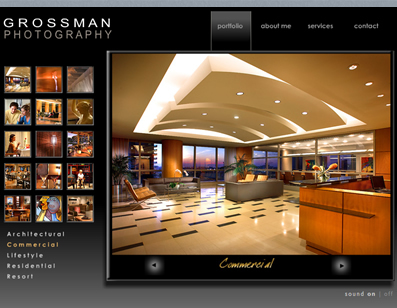 Grossman Photo is the official website for Florida-based professional photographer Barry Grossman. The website was contracted to Marcela through Guthier Enterprises, Inc. and consisted of dynamic programming and graphic design services. The website offers the best of a Flash interface with a dynamic and easy to update photographic slideshow element. 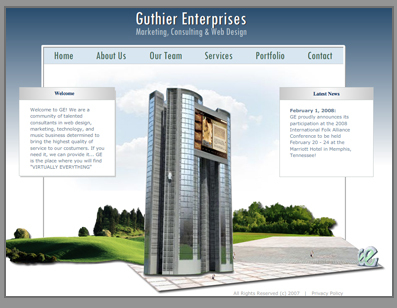 Guthier Enterprises, Inc. was founded in 2007 as a joint effort between Marcela Pineros and Allen Guthier. The company offers marketing, web design and consulting services to industries as varied as education, photography, law, fashion and music.. In addition to coordinating 3D rendering artists and Flash programmers, Marcela has spearheaded the design for the company’s business identity, ensuring the image of the company is accurately reflected in the polished look of the site. 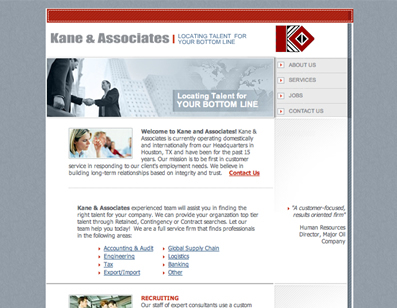 Kane & Associates is a job solutions company based out of Houston, Texas. Marcela worked on the customization of their web template as part of a consulting contract through Guthier Enterprises, Inc. In addition to developing custom Flash animations, Marcela’s design provided a user friendly interface for the backend administrative site. The main goal of this project is to put the lecture component of EME 2040 completely online. EME 2040, or Introduction to Educational Technology, is a course that was designed to meet the needs of future professionals, applying technology within educational settings.CITT will work with the PI on this project to develop resources in Flash and Captivate that enhance the experience of online students. As someone once suggested, “written goals have a way of transforming wishes into wants; cant’s into cans; dreams into plans; and plans into reality. Don’t just think it – ink it!” This workshop will present you with all of the benefits of establishing quality learning objectives that will in turn facilitate your overall course development. Turn your ideas into activities, your content in lessons, and your students into enthusiasts! 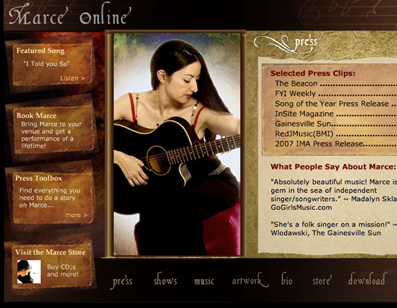 Combining advanced, interactive Flash animations with vibrant graphics, the marceonline.com website was nominated as a Finalist in the 2006 Independent Music Awards. The website incorporates original graphics, dynamic photo galleries and content management features to facilitate editing. 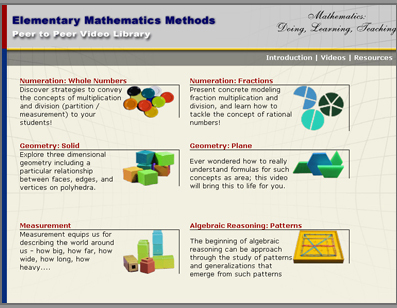 This Elementary Mathematics Methods Video Library presents preservice teachers in peer-to-peer interactions to model fundamental mathematical concepts across the K-5 mathematics curriculum.The project utilizes Windows Media 9. The setup allows future dubbing of the videos to multiple languages. For assessment, the project incorporated short quizzes at the end of each video that consolidates learning. 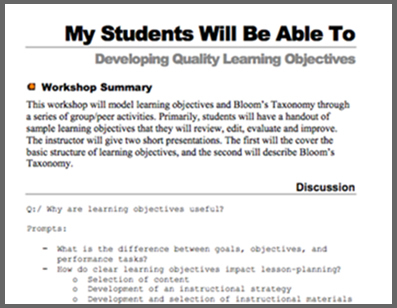 Worksheets are also provided for download. The Multimedia Instrument for Worldwide Greenhouse Education is a multi-state grant project that involves the University of Florida, the University of Vermont, the University of Arizona and Ohio State University. 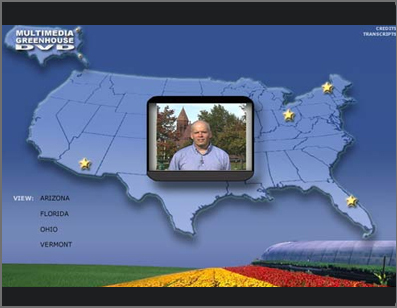 This portion of the grant was used to develop an interface for the Multimedia DVD which showcases videos taken on location at each of the participating states. The content can be viewed and browsed through by location and by topic. 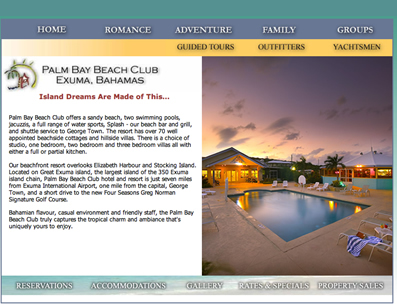 The Palm Bay Beach Club in Exuma contracted Marcela through Guthier Enterprises to develop a Flash intro and corresponding website to help inform potential patrons and promote the services of the resort. Phenylketonuria (PKU) is a common genetic condition that results in the inability to metabolize phenylalanine (an amino acid which is a component of protein.) The main goal of this project is to produce an educational CD and website that uses interactive play to teach children about their metabolic condition, its effects and management and that also allows parents (and other caretakers) to learn more about nutritional and medical management. 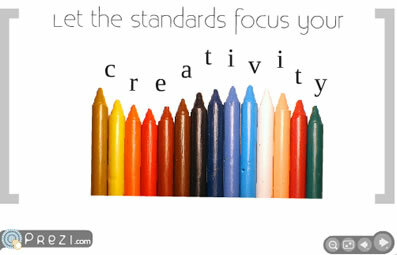 With so much focus being placed on standardizing the curriculum in K-12 environments, educators find themselves struggling to inject creativity into their design and planning. 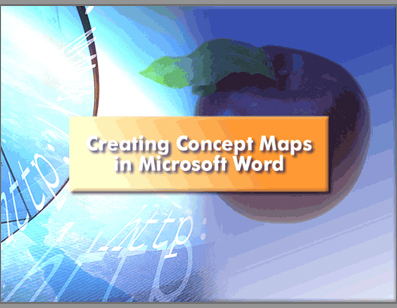 This presentation, offered in conjunction with Suzanne Williams in September 2009, gave participants at the Florida Council for Social Studies, 52nd Annual Conference a fresh outlook on curriculum and creativity. The workshop addressed revitalizing the social studies curriculum using backwards design principles while staying true to standards. Many people are intimidated at the thought of beginning a technology-based project. Where do you start? Marcela created this presentation to be used as an introduction for all clients at the Center for Instructional Technology and Training at the University of Florida. 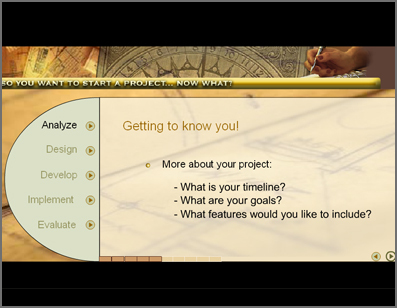 In it, clients can find a step-by-step description of the lifecycle of a project at CITT. They are able to learn about the project management cycle and find useful documents for download that help them get one step closer to their goals! This project consists of six web-based Flash modules where students proceed through a series of steps to help improve their Spanish pronunciation. These steps include: an explanation of sounds, an animation of examples of the sounds in Spanish, as well as contrasts with English; activities for perception and production practice; and a final activity in which students record and replay their speech to analyze their errors. The six proposed modules encompass what most teachers and researchers consider to be the pronunciation errors that are either most distracting or most annoying to native speakers of Spanish. 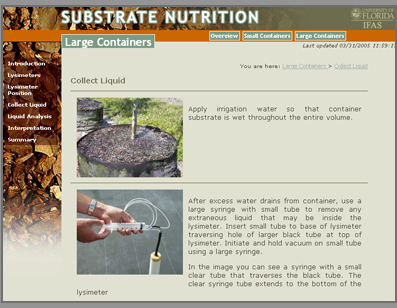 This project was developed as part of a Ph.D. thesis to illustrate the use of leaning objects in microirrigation training. 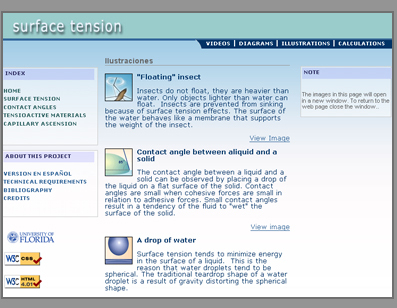 In this web page you will find information, media, original graphics and animation related to surface tension, contact angles, tensioactive materials and capillary rise. 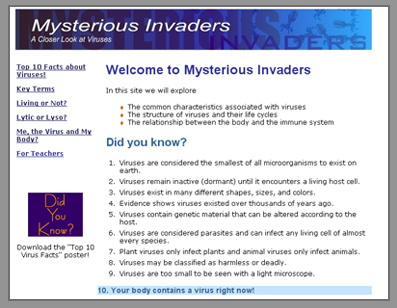 We’ve made our best effort to offer an interactive site that involves the student in the learning process. The page contains content in Spanish with some translation to English. The Areawide Management Evaluation of Melaleuca quinquenervia (TAME Melaleuca) was recently established as a collaborative multi-agency project under the USDA Agricultural Research Service’s Area-wide Pest Management Initiative. This site is a resource intended to educate land managers, encourage adoption of control methods and disseminate information on the dangers of this invasive species. 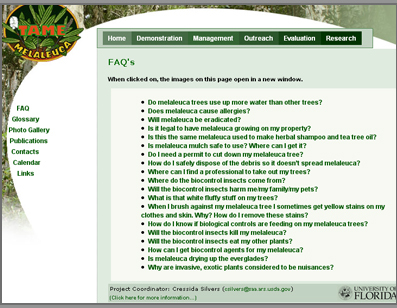 The Areawide Management Evaluation of Melaleuca quinquenervia (TAME Melaleuca) was recently established as a collaborative multi-agency project under the USDA Agricultural Research Service’s Area-wide Pest Management Initiative. This contract consisted of a website assessment, geared toward validating ADA accessibility, W3C standards compliance and usability. Marcela reviewed the development progress at critical stages and provided assessment reports that were then used to improve and optimize production. 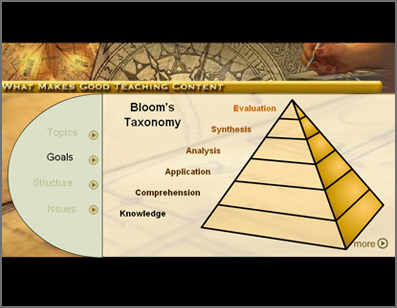 The four modules help teaching assistants understand the importance and value of technology in the classroom by covering the following topics: Technology and Task Design, Evaluating Activites, Synchronous Computer-mediated Communication, and Asynchronous Computer-mediated Communication. 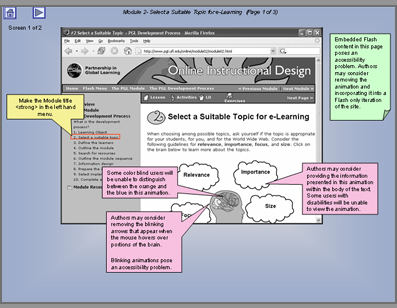 The modules were developed using PHP technology, allowing the user to enter information that can later be viewed in the course of the module and printed for assessment. 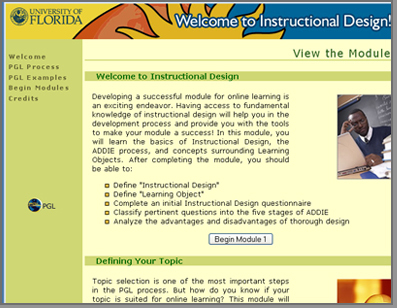 User participation is encouraged, thereby enhancing the interactivity of the modules. 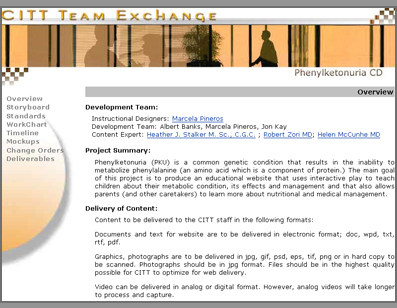 The Team Exchange websites were designed by Marcela to streamline and facilitate project management at the Center for Instructional Technology and Training. 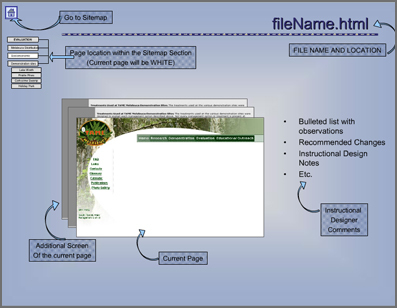 The website houses the documentation pertinent to a given contract, including work flow, spreadsheets for file tracking, storyboards, timelines, etc. 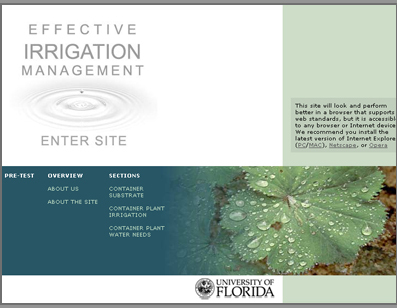 The Multimedia Instrument for Worldwide Greenhouse Education was a project involving the University of Florida, the University of Vermont, the University of Arizona and Ohio State University. 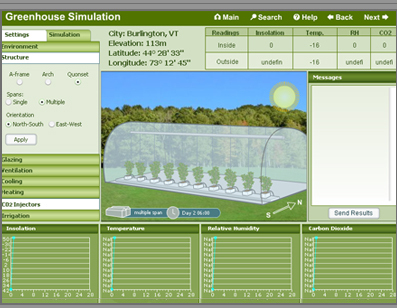 A portion of the grant was used to develop an interface for the Interactive Greenhouse Simulator. Marcela designed the front-end with clear coding parameters so that the back-end (to be developed by another team across the country) can be integrated seamlessly. MarcelaPineros.com is powered by	WordPress 3.9.27 and delivered to you in 0.307 seconds using 24 queries.